The players in the rugged smartphone business have grown over the past few years and so as the market for the smartphone. Oukitel WP5000 is about being durabie offering a triangle of protection which includes dustproof, waterproof and shockproof. Unlike your average smartphone, the smartphone is stuffed up with features that makes it ideal for rigorous environments Besides being a rugged smartphone, it tries to offer a level of nice mid-range features to cater for your other needs. For the record, the Oukitel WP5000 doesn’t deviate from typical rugged design we’ve been seeing in time past. The smartphone comes with a combination of rubber, plastic and metals to achieve its military grade status. You can see the screws visibly used to hold things together at the rear. There is a metal plate also present at the rear within which you find the camera and the fingerprint scanner just below as well is a similar one hiusing the Oukitel name at the bottom. Speaking on the display, there is a fair arrangement on the smartphone but certainly not the best among mid-rangers. Nonetheless, the Oukitel WP5000 ships in with a 5.7-inch LCD plain infused with a 1440 X 720 pixel resolution. 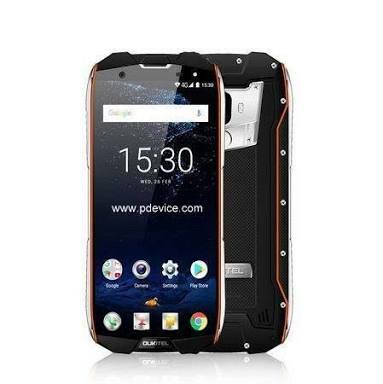 One of the stand out feature on this smartphone is its big battery capacity which is omportant in rugged smartphones. That said, the smartphone ships in with a 5, 200mAh non removable battery and also supports quick charge. You can count on a fairly decent optics on the Oukitel WP5000 to make your pictures worth the while. Although, not quite top of the line in that aspect it holds its own in the category it occupies. Also, it keeps up with the trend of dual cameras with the 16MP plus 5MP rear cameras while the front is occupied by an 8MP sensor. Behind the whole ruggedized surface lies a decent MediaTek SoC which by the way as eight cores. The MediaTek Helio P25 processor clicks at 2.5GHz highest and is paired with a Mali-T880 MP2 GPU. Even if the benchmark scores of the smartphone is not very impressive, it is good enough for most of the tasks on the snartphone. Moving further, it carries a 6GB RAM and a 64GB storage space which is good enough for a mid-range smartphone. However, it draws back when it comes to operating software, with the Android 7.1 Nougat of last year. The smartphone costs about 86, 000 Naira on online stores depending on the deal and your location.